There are several easier ways to grow a mini wildflower meadow which as the image right shows looks lovely creating a colourful area in the garden attractive to bees, butterflies and other pollinators. To grow wildflowers in this way you need a small patch and a limited amount of time. The trick is to buy a self seeded roll of wildflowers which still requires preparation, but germinates easily, and produces a great result. Buy a self seeded wildflower roll, these are sold by many of the reputable Internet gardening suppliers. Don't be concerned if it looks flimsy; just handle it carefully and I would suggest you lay it out on a dry day so it doesn't get water-logged and rip. Clear a patch to ensure it is weed free the same size as the length of wildflower roll. I laid two rolls to get a more colourful effect.You could remove a section of turf, or use a part of an existing border as long as it is weed free. Rake it well because the seeds need to germinate and grow up through the soil which needs to be quite fine, without any large clods. The soil does not need any enrichment, wildflowers are not fussy. Whether the growing conditions are damp, shade or sun will depend on the wildflower mix you buy as they are now sold for different conditions. The one illustrated is just a general mix which needs some sun. Lay the wildflower roll/membrane where you want it to grow, and lightly cover with fine soil until it is completed covered. Don't forget to water, which is the only maintenance needed for this project; you do need to take care to make sure the area where the wildflower roll has been placed does not dry out in the early stages of germination. Not often a problem but sometimes we do have dry weather in spring. 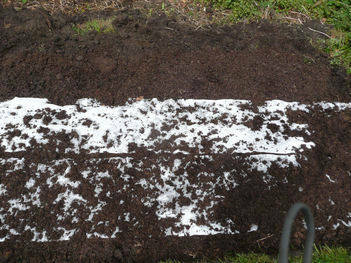 This is how the patch looks just as the seedlings start to emerge. 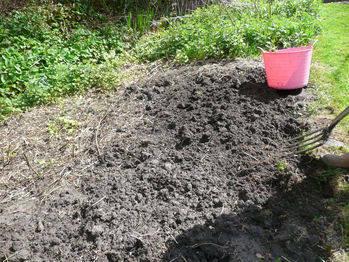 It is very important with small seedlings to ensure they do not dry out. Here the seedlings have grown on this image was taken about a month later and some are just starting to flower. 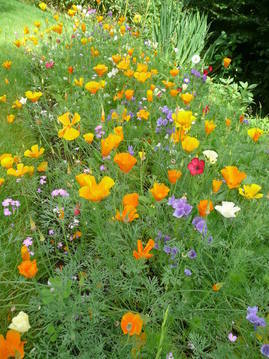 Wildflowers are easily grown from a seed mix which easy to germinate. 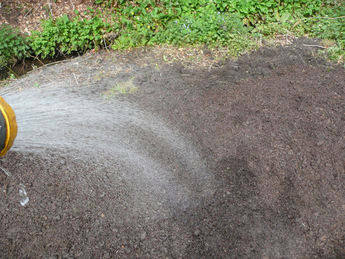 If you want to create a larger areas seed is more economical. There are a good variety of wildflower mixes on sale and the seed is much cheaper than the impregnated Matt. 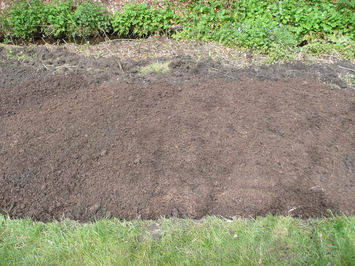 The steps are just the same as above in terms of clearing the ground and raking the soil. Once the ground is clear of all weeds and well raked, sow the seed as per the directions on the packets which usually is a set amount of grammes per square meter, water well and wait for it to germinate. I found wildflowers, because of the varied mix, flowered for many months and the image right is of the patch in September when it was still full of flowers and attracting the bees and butterflies.